The Cowboys coaching staff is already in Orlando, FL working with the NFC team for the 2019 Pro Bowl. 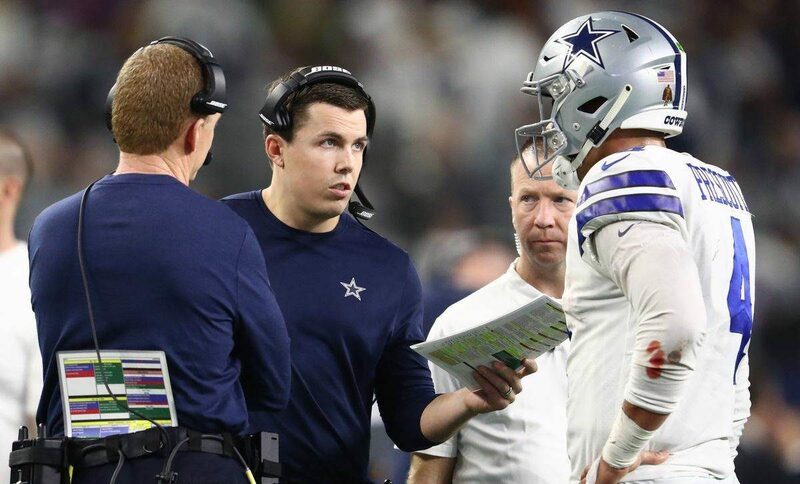 One of those staffers is Kellen Moore, who is a heavy favorite to become Dallas' new offensive coordinator. Could this weekend's game be his audition? Moore's previous job as the quarterbacks coach has already been given to former QB Jon Kitna, who is with the team this week working at the Pro Bowl. The previous OC, Scott Linehan, is not there after being fired early last Friday. With Kitna as the QB coach and no official OC announced, it appears Moore is serving in the coordinator role this week. Moore will have several of his Cowboys players to work this weekend. Ezekiel Elliott was part of the original Pro Bowl roster, and Dak Prescott and Amari Cooper were named to the team recently as alternates. Offensive linemen Tyron Smith and Zack Martin were also named to the original roster, but both are going to sit out this weekend due to injury. Dallas may not be using this week to learn anything about Kellen Moore, who they clearly already have a high opinion of. But it will still serve as a good experience for him before potentially taking the reins of the Cowboys offense in 2019. If nothing else, it's an added level of intrigue for Cowboys fans this weekend.